In The Philippines, Signs Of Hope As Relief Efforts Pick Up : The Two-Way The death toll has edged up, but an international relief effort is delivering much needed aid to hard-hit and hard-to-reach areas. A little over a week after a typhoon devastated parts of the country, victims also took solace at Sunday services. 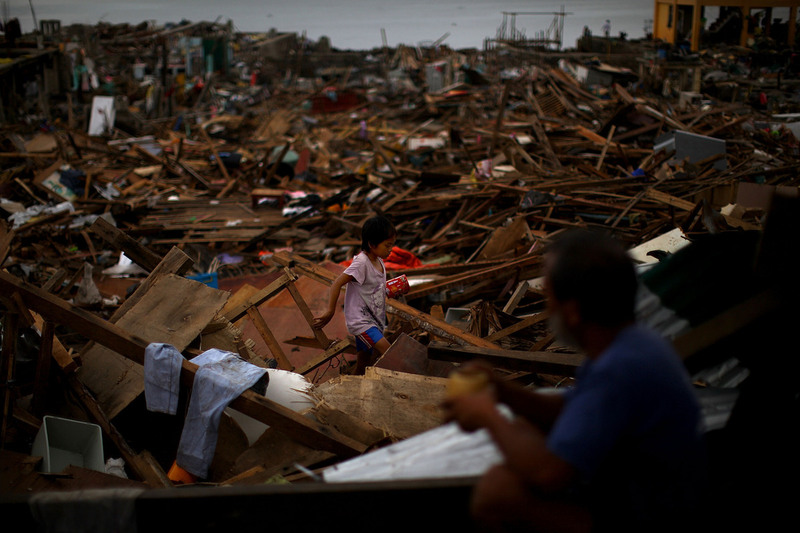 A girl crosses between collapsed roof tops in the damaged downtown area in Tacloban, Philippines, on Sunday. But once Russell boarded a C-130 military transport aircraft for Tacloban, the capital of Leyte, he saw a "vast wasteland, wrecked by the typhoon's fury." When he landed, he tweets, he saw lines of people waiting to take that same C-130 out of Tacloban. "Driving into town, you notice how quiet it is," Russell writes. "People have lot of outdoor fires for light and cooking. People line up for supplies, gas, food, whatever. Stray dogs lope along the main road. It's been cleared of debris, but is still a mess. Piles and piles of debris, wrecked cars, downed power lines, you name it. It's utterly amazing." The official death toll has inched upward to 3,681 with 1,186 still missing. On the bright side, NPR's Anthony Kuhn says the relief mission has now turned into a concerted international effort with around two dozen countries contributing. Anthony tagged along with American Marines on a mission from Tacloban to the nearby Samar Providence. When the helicopter lands in Samar, "the crowds at the field's edges erupt into cheering," Anthony reports. "Local authorities have to hold them back to keep them from rushing the planes." Maj. Gen. Romer Poquiz of the Philippine Air Force told CNN that same scene repeated itself over and over across the affected areas. "People swarm the helicopters, so we land the helicopters a little bit farther from the population areas," he said. "So before the people come in, we would take off, go and drop in other places, drop and then go, drop, go, drop, go, at various places." The AFP reports that today many of those affected headed to Sunday service, which "offered a moment to escape the grinding battle to survive in the wastelands." About 300 people attended service at the ruined 400-year-old Immaculate Conception church in Guiuan. The AFP spoke to Belen Curila. "I wish to thank the Lord. We asked for his help for all the people who survived this typhoon to be able to eat and continue a life that is hopefully more blissful," the 71-year-old said. "The Lord has strengthened our faith and made us stronger in order for us to survive and start off all over again."